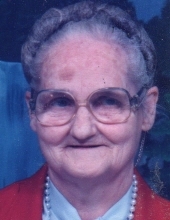 Annie Mae Justice Hipps, 92 years of age of Grundy, VA, passed away Sunday, March 17, 2019 at Buchanan General Hospital. Born January 19, 1927 in Hurley, VA, she was the daughter of the late Herbert and Nettie Roberts Justice. Annie enjoyed sewing, working in her flower garden and was of the Pentecostal faith. A loving mother, grandmother, and sister. In addition to her parents, she was preceded in death by her husband Charles Stuard Hipps, grandson Joshua Hipps, granddaughter Amber Justice Hipps and four brothers. Survivors include her daughters Ruth Naomi Lester and husband Lonzo of Grundy, VA, June Packard and husband James of Avon Park, FL; sons Benny Hipps and companion Shirley Langley and Donnie Hipps all of Fredrick, MD, Teddy Hipps and wife Charlotte of Hurley, VA, Tommy Hipps and wife Leslie of Walkersville, MD; brothers Earl Justice and Bill Justice and wife Janet all of Mount Vernon, OH. She is also survived by her grandchildren: Lonzo Lester, Jr. and wife Stacie, Teresa Skeens, Tammy Shortridge and husband Tim, Shonna Hipps, Justin Hipps, Ryan Hipps, Kimberly Gilley and husband Joe, Brandon Hipps; several great-grandchidren, step great-grandchildren. nieces and nephews. Funeral service for Annie Mae Justice Hipps will be held at the Shortridge-Ramey Funeral Home Chapel of Grundy, VA, Friday, March 22, 2019 at 12:00 noon with Reverend Jerry Ward and Reverend Mike Ashby officiating. Entombment will follow in the Mountain Valley Memorial Park, Big Rock, VA.
Honorary pallbearers will be Dr. Quinn, Dr. Clint Sutherland, the nursing staff of Grundy Heritage Hall. The family will receive friends at the Shortridge-Ramey Funeral Home of Grundy, VA, Thursday, after 6:00 p.m. with evening service to be held at 7:00 p.m. The family of Annie Mae Justice Hipps have entrusted the care of their loved one to Shortridge-Ramey Funeral Home of Grundy, VA.
"Email Address" would like to share the life celebration of Annie Mae Justice Hipps. Click on the "link" to go to share a favorite memory or leave a condolence message for the family.